In my last post, I mentioned the Glenfiddich 50 year old and the fact that I would have to commit some sort of felony to obtain this a bottle. Well this new release from Whisky Fun, the Glen Wonka, makes Glenfiddich 50 look like a bottle of Buckfast. 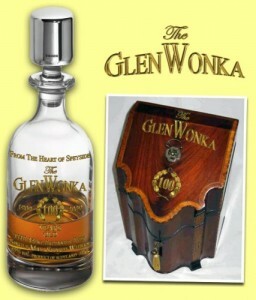 The GlenWonka ’100 years old’, distilled in 1909. The most expensive Scotch ever, until the next one. 5 decanters only, with complimentary Aston Martin. 40% vol. 70cl. 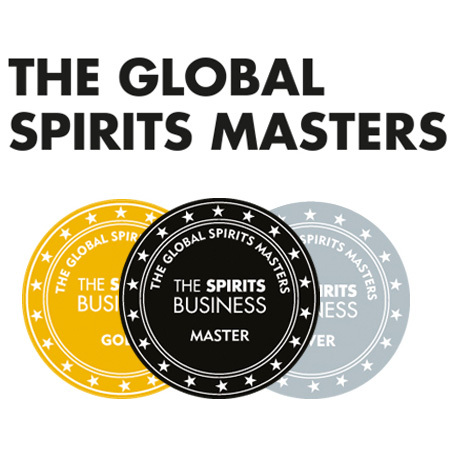 Glen Wonka: The Whiskies of Tomorrow with our past in mind. Remember together we can make Scotland a better world. Some People might think this is a fakey. More fool them. I am hoping after this unbeleivable plug, Whisky fun send me a sample. I hear a dram of it will give you eternal life and if you have a second dram, Jessica Alba will be magically transported to your lap, naked. N. SWEET VISHNU! Never have I encountered such a swirling, vibrant interplay of oak and malt at such immense age. The fruit glimmers like the tail feathers of a frightened peacock disappearing into a dark forest of European oak. There is spice also, I am returned to my long summers as a child working the street markets of Bombay, ahh olfactory nostalgia of the highest order. There are even whiffs of the pre-war sense of foreboding and apprehension that pervaded the world of 1909 into which this magnificent spirit was spawned. P. Now we’re getting down to it. Reminds me of all the women I’ve ever seduced rolled into one and finished with a fine Cuban. It dances a true ballet on the palate, engaging all parts of the tongue. Rich notes of leather upholstery, old copies of National Geographic sat for decades in a private school’s headmaster’s study all rounded off with a deft flutter of the silkiest tannins. 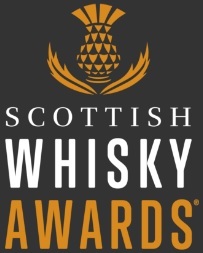 Makes me pine for the great lost Speyside character of old that I was proud to turn the world’s attention to many summers past. Such complexity for the age, like spending an evening with Winston Churchill in a whirlwind of whispering smoke and well stewed fruits. F. No finish on this baby, finishes end, God’s got some thinking to do as this old beauty redefines eternity. WOW! An orgasmic tsunami of peat that peaks and seems to fade like the lingering memories of the finest Brazilian hookers, warm and spicy but with bite. A truly memorable drinking experience, on a par with the Uigeadail for Canada but it even eclipses that wild warhorse in the end. B. Well what can I say? I was hoping for something special but this takes the piss. I’m so glad I came up with the idea of using peat to dry the barley otherwise whisky production might not have been sustained through those delicate pre-war years and this bottling might never have been. As it stands this bottling has done me proud. This entry was posted	on Thursday, August 20th, 2009 at 7:57 am	and is filed under News. You can follow any responses to this entry through the RSS 2.0 feed. Responses are currently closed, but you can trackback from your own site.